This impressive oven-ready, clove-studded joint of gammon is ideal for entertaining because it is easy to carve and may be served hot or cold. For a special occasion serve it with Caramelised Apples with Calvados. Place the joint on a trivet in a roasting tin, loosely cover with foil and roast in a preheated oven at 180°C, gas mark 4, allowing 65 minutes per kg plus 65 minutes. Remove the foil for the last 30 minutes of cooking and, if liked, drizzle 2tbsp clear honey over the top. Remove from the oven and allow to stand, covered in foil, for 10 minutes before carving. Serve with boiled Jersey Royal new potatoes, buttered baby carrots and green beans. 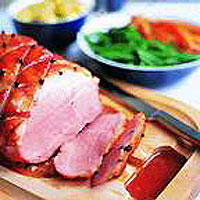 If serving the gammon cold, accompany with a selection of salads, new potatoes and Waitrose chutneys or pickles. Alternatively the joint may be boiled. Place the gammon in a large pan of boiling water, cover and simmer gently, allowing 55 minutes per kg. Add extra water during cooking if required.